What Qualities Do You Value? What is the most effective way to develop your children’s emotional intelligence? It is vital that children develop their emotional intelligence, for this guides their thinking and behaviour. Yet emotional intelligence can be incredibly difficult to teach to children, which is why Brilliant Publications has produced 5 resources to help you. We don’t like singing our own praises, but they have been very well received by teachers. The stories can be used at specific times of the year, or when issues arise, or whenever you are suddenly called upon to do an assembly. 5 0 Fantastic Assembly Stories for KS2 are set in Mill Lane Junior School – a fictional school. Each provides a moral dilemma for the character(s) to consider or tackle. Your pupils will relate to the character and the character’s dilemma. The author, Adrian Martin, has been a headteacher for many years. His pupils have loved getting to know the different characters at Mill Lane Junior School, and have remembered the stories long after they first heard them. Teaching Values through PSHE and Citizenship provides teachers with 38 activities for children aged 9 to 13 years old which promote the fundamental values of democracy, the rule of law, individual liberty and mutual respect and tolerance of those with different faith and beliefs. 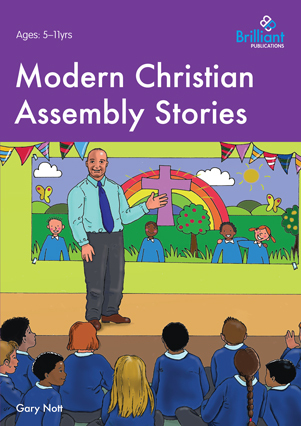 Modern Christian Assembly Stories is a collection of 50 contemporary stories written by Gary Nott who deploys the very best techniques of storytelling. Using modern situations and idioms, which are familiar to children, Gary communicates the wisdom found in Jesus’ parables, making the stories ideal for schools wishing to ensure that their collective worship is, in the main, Christian. Are you running out of ideas for assemblies? Brilliant Class-led Assemblies, will provide you with 10 easy-to-use, stress-free assemblies linked to the National Curriculum for science, history and geography. All these tried-and-tested assembly scripts can be easily modified to suit your class and can be as elaborate or as straightforward as you wish. Your pupils can participate as narrators, evacuees, water droplets or investigators, even the River Nile! The assemblies are constructed so that all the class can be involved in some way. All can be introduced and done within one week. More Brilliant Stories for Assemblies contains over 50 stories for use in primary schools. The stories range from those dealing with specific issues, such as bullying, falling out with friends, racism and disability, to historical and religious stories. These books are available in printed form and as an e-book which enables the pages to be displayed on an interactive whiteboard. Need to do an assembly? Don’t panic! Our new assemblies catalogue is now available! We have a range of assembly story books covering personal and social development, religious and curriculum topics. So, if you’ve been asked to take an assembly at short notice, don’t panic! All the books are available as e-books, enabling you to download and use them straight away. Are your assemblies in the main Christian? ollective worship is, in the main, Christian. Billy loses his trunks whilst swimming at school – how embarrassing! What will he do? Listen to his hilarious story. David is missing his best friend, who has left school. Then he meets Arthur, the new boy. Arthur is different. He is autistic: he canʼt speak. How can David make friends with him? Joshua is fascinated with fire but one day goes too far and sets light to his school. What will his headteacher and parents say? Katherine is excited when she is chosen to be head girl. Then she receives a poison pen letter from a jealous classmate. How will she cope with her disappointment? Mr Ripple has an idea for a class assembly with a difference. He asks his class to bring their pets into school. Then things start to go wrong with consequences he could not have foreseen. 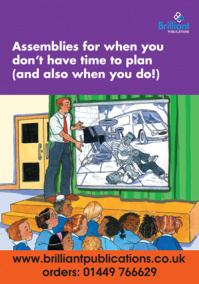 Don’t forget – there are sample assembly stories from all our assembly books on our website – so you can try before you buy! Should the daily religious assembly be scrapped? A study by the University of Leicester, for the Arts and Humanities Research Council says that daily assemblies which must be Christian in nature, could discriminate against other religions. I think there is value in collective worship which encourages children to reflect on belief, and helps shape values of tolerance, respect and understanding for others. Whether this needs to ‘in the main Christian’, however, is more debatable in my view. We understand that finding new and curriculum-led assemblies can sometimes be a little time consuming, and it is with this in mind that we have developed a number of resources to help you.